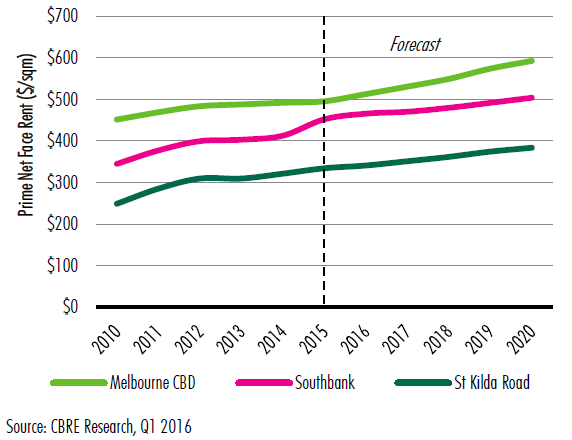 ​Melbourne, 22 June 2016- Melbourne has joined Sydney in recording healthy face rental growth in the office market in the first quarter of 2016 according to recent research by CBRE. The Q1 2016 Office MarketView states that after remaining steady for the past 12 months, prime net face rents in the CBD rose 2% to average $505 per sqm over the first quarter. Prime incentives remained stable over the year, averaging 33%. Felice Spark, Associate Director, Research, said that steady incentives and higher face rents supported a slight recovery in prime net effective rents, up 1.5% over the quarter. “Having trended downwards since 2012, prime net effective rents are expected to continue their recovery in 2016,” Ms Spark said. 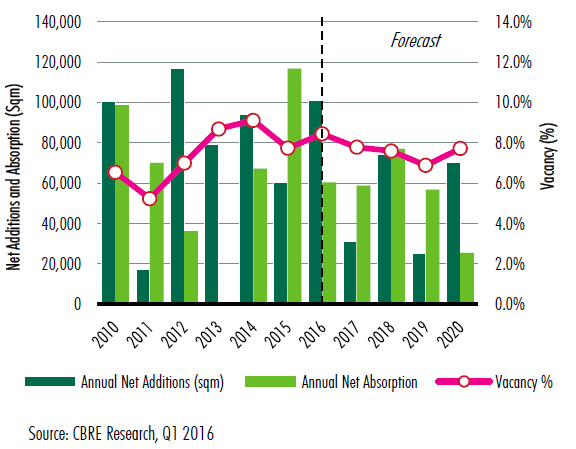 White collar employment grew in 2015, aiding positive net absorption and a decline in vacancy. As at January 2016, vacancy in the CBD was down 140bps from 12 months prior to 7.7%. 2015 saw the 13th consecutive year of positive net absorption in the Melbourne CBD and was the strongest level seen in eight years. Annual net absorption totalled 116,760sqm, significantly above the long term average of 88,000sqm. 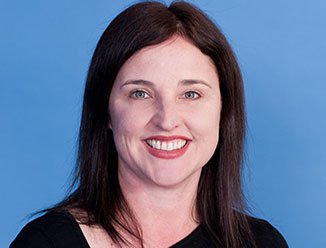 “Net absorption is predicted to remain positive over the short to medium term off the back of further growth in white collar employment and tenant migration from the outer precincts into the CBD,” Ms Spark said. The St Kilda Road precinct is performing strongly, with prime net face rents continuing to rise, as they have done for the past five years. As at Q1 2016, prime face rents averaged $334 per sqm, up 1.7% from the past year, with incentives stable at 25%. Anthony Park, Director, Office Services, said that the St Kilda Road precinct continues to see solid demand for office accommodation, as well as diminishing supply as office buildings are withdrawn for residential. “As a result, vacancy in the St Kilda Rd precinct has been steadily declining over the past two years, dropping to 8.9% at the start of this year. It’s now at its lowest level for five years and is expected to reduce further in the short term,” Mr Park said.